His five victories over Chinese players earned him the nickname the "Chinese Slayer" by the online community during his fairy-tale run at the Thailand Masters, but that mantle does not sit comfortably with Singaporean shuttler Loh Kean Yew. The 21-year-old told The Straits Times: "It's unnecessary pressure, and not so nice. Just call me by my name lah, aiyoh." The world badminton fraternity will surely know his name by now after his stunning 21-19, 21-18 victory over Chinese legend Lin Dan in the men's singles final at the US$150,000 (S$202,000) Princess Sirivannavari Thailand Masters in Bangkok yesterday. Loh, who entered the encounter with just four lower-tier titles to his name, compared with Lin's 65 that include two Olympic golds and five world titles, took the game to the 35-year-old veteran from the off, directing a smash at the world No. 13's body that went unreturned to earn the first point. While the Chinese used his experience and moments of magic to open up leads in each game, Loh refused to be intimidated, staying patient, chasing lost causes for precious points and continuing to play an aggressive game. It paid off. "It is an honour to play against Lin Dan. This has been my dream since I was young," said Loh. "He has good touches and is very calm on court. I was nervous, and tried my best to cope with the situation. I just kept telling myself to stay focused. "Both of us had played many long games and I think my younger age helped me recover faster than him and I was able to outrun him." There was no time to celebrate with his US$11,250 winner's cheque, however. Hours after the biggest win of his career, Loh was off to Denmark, where he has a league game today for Langhoj Badminton Club, whom he is contracted to until the end of this month. In the longer term, the 2015 SEA Games men's singles bronze medallist is aiming for another podium finish at the Asean meet this year, as well as qualification for next year's Olympics. He added: "My targets are not going to change just because I won a tournament. It is important to be consistent. Winning Olympic gold has been my dream and this has not changed too." It is an honour to play against Lin Dan. This has been my dream ... I think my younger age helped me recover faster... and I was able to outrun him. 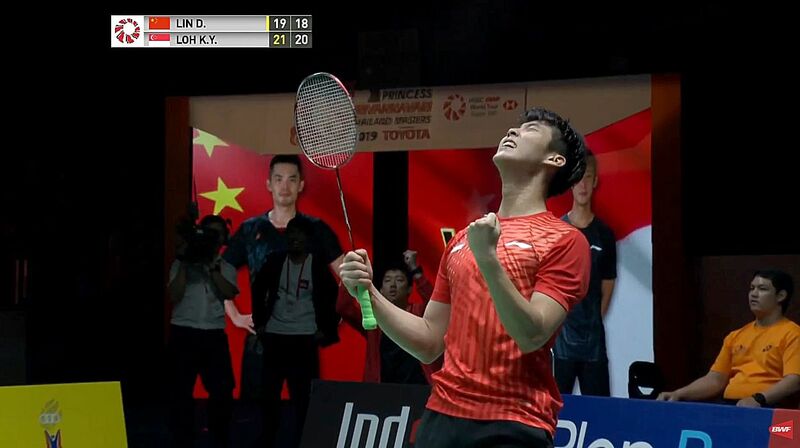 LOH KEAN YEW, on beating the Chinese legend. This is the first time Loh has reached the final of a Level 5 (Super 300) tournament on the Badminton World Federation's World Tour and won. National singles coach Kelvin Ho said: "What Kean Yew did right was being able to be patient and focused, yet calm and daring to handle certain situations. "He should take this win as motivation to study more of his own game and that of other world-class players, and continue to improve." Singapore Badminton Association (SBA) president Lawrence Leow also hailed Loh's achievement, saying: "This achievement is especially remarkable as he just returned to the national team last October after serving his national service. "His win is a great encouragement for everyone on the national team. He has done well for Singapore and we are very proud of him. Kean Yew is one of our players who will be closely watched by others in the international scene." There was more good news for the SBA as Danny Bawa Chrisnanta and Tan Wei Han won the Estonian International mixed doubles title after beating England's Gregory Mairs and Victoria Williams 21-18, 14-21, 21-15 yesterday.